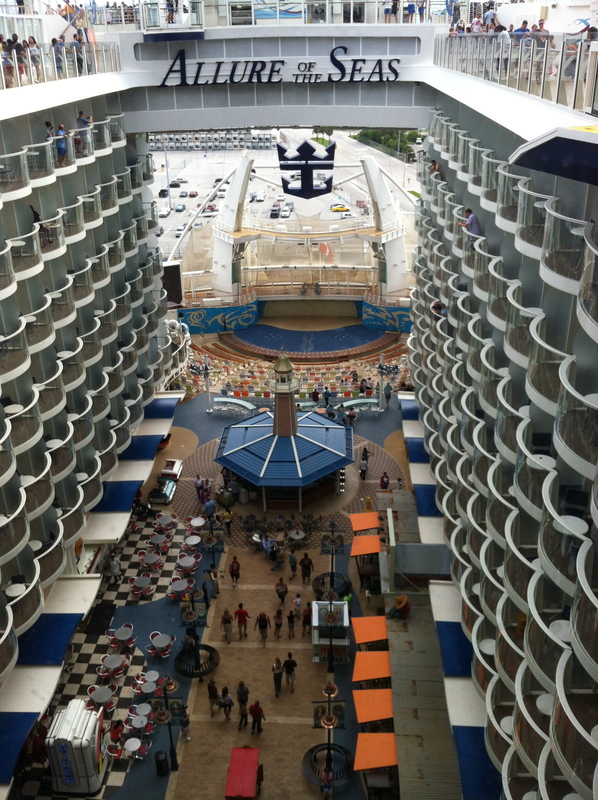 Trying to do a “quick” tour of the Allure of the Seas, is really an impossibility. This is the largest ship on the water right now, getting around takes some planning…and comfortable shoes! One of the new “wow” features of this class of ship is the boardwalk. The back of the ship is open to the sea. Its a pretty cool concept. I decided to book a boardwalk balcony cabin since it is only available on this class. 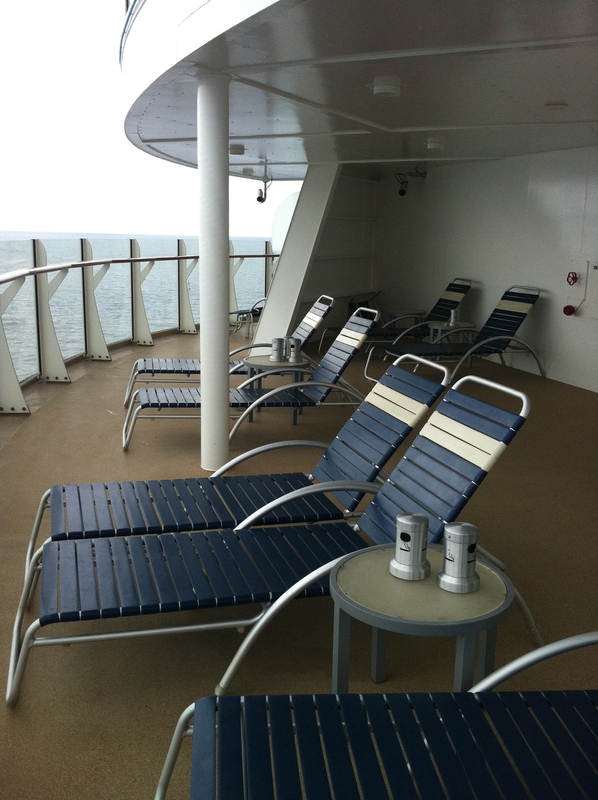 It is also a cheaper option to booking a standard balcony, but you can still get that balcony feel. I really liked the boardwalk balcony cabins. For this trip, we booked 2 adjoining cabins so that we could have the two bathrooms. Really not a huge issue, since it is three guys and me, but something we really like to have. On the exterior balconies, if you have adjoining cabins, the divider on the balcony can be removed to make one big balcony. This is the same on the boardwalk balconies, our stateroom attendant was able to do that with no problem when we requested it. Depending on where your cabin was, you could see the ocean as well as the activity going on at the boardwalk. 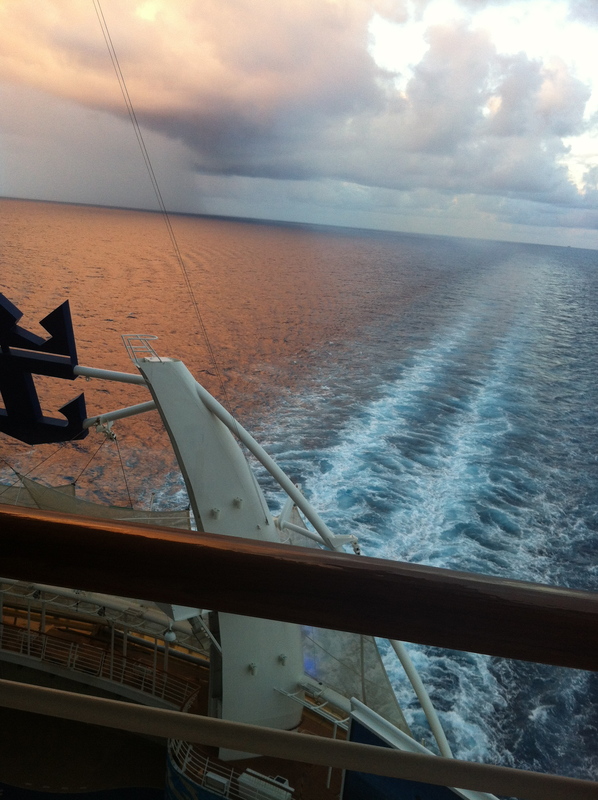 We were towards the aft of the ship and had a fantastic view of both the boardwalk and the ocean. If I were ever going on this type of ship, I would certainly book there again. Certain floors had a “secret” public balcony where there were lounge chairs and such and from there you could see everything going on in the Aqua Theater as well. Every morning, I would get some coffee and go sit on the aft balcony, there was never anyone else out there. 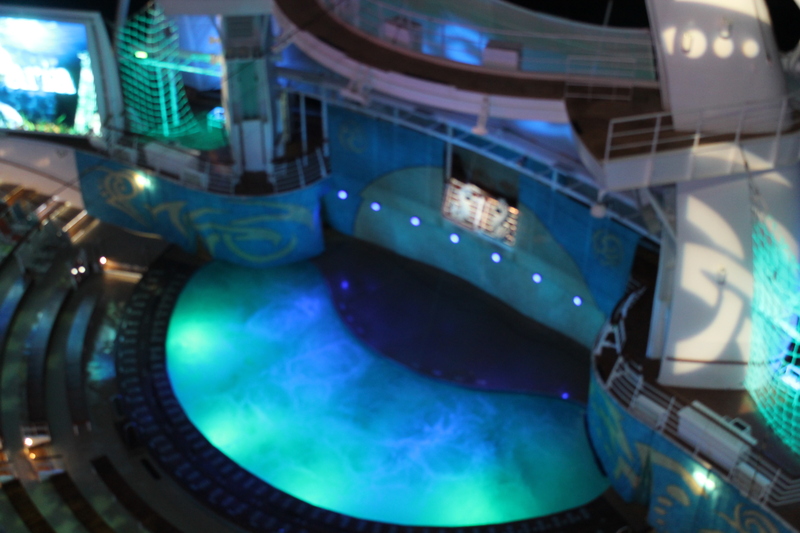 The Aqua Theater is another cool new concept on this ship. It hosts things like a diving show and the ever popular Belly Flop Contest. They can also cover the aqua part of this and it becomes a regular theater venue with large screens so everyone can see what is going on. It also hosted one of the dreaded muster drills, which was nice for those folks that had that station, with all the seating, it eliminates that wonderful tradition of standing crammed next to people you have never met to listen to a recorded safety briefing. 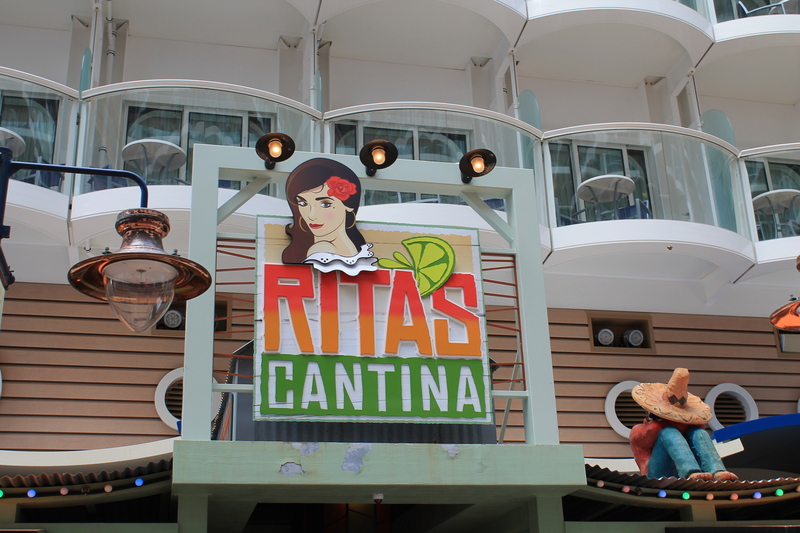 The boardwalk has many cool features and new restaurants. There is a hot dog stand with a bunch of different choices of styles and toppings, a donut house that supplies your donut fix all day long, a Johnny Rockets, and a Mexican style restaurant called Rita’s Cantina. I never ate here, but it looked like most folks were enjoying it, especially the margaritas if the crazies dancing on the patio in giant sombreros are any way to judge! That may be due to the fact that if you purchased their meal package, THREE margaritas were included! I am allergic to tequila, I break out in pregnancy, so I never touch the stuff anymore! 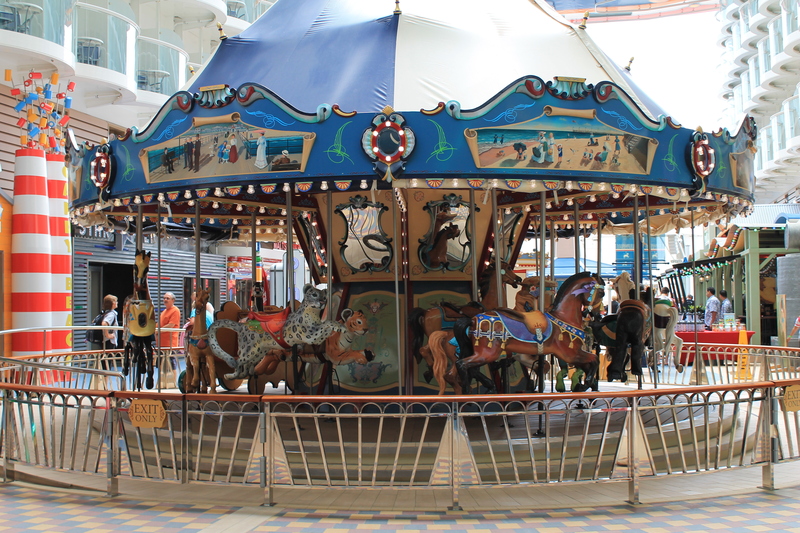 Also on the boardwalk is a real, working carousel. There is no charge to ride so the “kids” can ride over and over if they want! There was rarely a line, so it was never any problem getting on. Some other highlights of the boardwalk are the Pets at Sea, the candy store, and the Ice Cream Scoop Shop. On some days, they have a boardwalk party where they have face painting, balloon animals, popcorn, cotton candy, and all sorts of other cute games and activities for kids and kids at heart. The diving show in the AquaTheater is nothing short of spectacular. Think Cirque du Soliel in water. If you take the ship’s “All Access” tour, you will get the behind the scenes of what it takes to produce a high dive show while on a moving ship on a moving ocean. It really is a marvel. I did not take any pictures of the show because they ask you not to…not that I am usually one for following rules, especially if it involves getting a good picture, but I certainly did not want any sort of flash from my camera to be the cause of any diving mishaps. 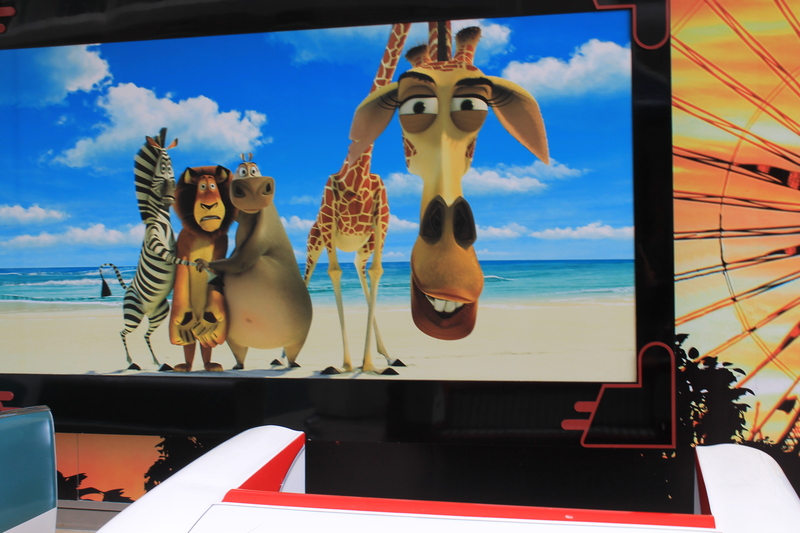 Royal Caribbean has partnered with Dreamworks so there are multiple references around the ship. I thought it was a pretty good balance of being visible, but not in your face. If you had no interest or have kids that are nervous around huge, walking animals then you could certainly go the whole cruise avoiding them. However, if your kids are like mine and have to meet every character they come across, there are plenty of opportunities to do that as well. There is a Dreamworks character parade, a meet the characters breakfast with a chocolate theme (my kids really liked this! ), and various other “meet & greets” around at different times. 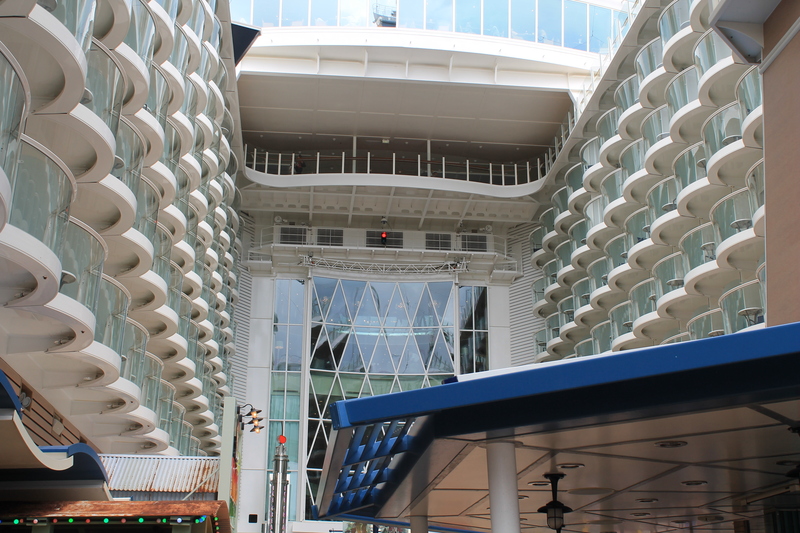 That’s all I’ve got for the Boardwalk on the Allure, but that is only one of SEVEN different neighborhoods on this mega-ship. I will try and finish this up pretty soon, because in a few weeks, I am leaving for my next cruise on the Freedom of the Seas!